I am not sure if I need to enter here or in another spot but I will give it a go here.. I follow you on facebook. It is fun seeing newer quilters develop their passion about quilting. Thanks for participating in the blog giveaway. I am sure you are going to meet lots of great quilters. I don't know how you could top 52 in 52. The only thing you might try is upcycling fabric into quilts. I just started shopping Goodwill for 100% cotton clothes that I can cut up and use in quilts. It's kind of fun to see what I can use in a quilt. I'm having a hard time deciding between Soldier Star and Flight of the Dragonfly. They are both really pretty. I think that 52 is an amazing accomplishment. Perhaps you want to try 10 new patterns that are more complex than what you have already tried.. or a different technique- paper piecing, applique, trapunto, reverse applique, curved piecing just to name a few.. There are many more.. The thing about quilting is there are so many choices to make and lots of different things to explore and challenge one. Enjoy.. I have a friend who owns the LQS and just sent her an email telling her about the giveaway and your blog and asked her to share it at the shop tomorrow. I'll be stopping by the shop tomorrow so will remind her and tell any of the customers who happen to be there. She's kind of used to me going in the shop and helping her customers while I'm there. I will share your link on my facebook page- my other quilty friends will love your black and white fabrics too. Thanks for participating in the giveaway. Wow! What an accomplishment. I can't think of a new goal, maybe a quilt each week in a different pattern each week. or maybe go for 52 larger quilts. Your rag quilts inspired me to make one for my daughter. It's 72x60. She wanted a really large throw. Thanks for your good instructions. I follow via GFC and Google Reader. I think you should try a queen sized quilt! I like Tanya's pinwheels....love the colors. I also follow you by email subscription that way for sure I won't miss your posts.. I think 52 in 52 is amazing! So perhaps if you need a new challenge for 2013, it should be to make 25-50% of those quilts bigger than baby sized. Nothing crazy like king sized.. just single bed/twin sized? or even throw sized? Or try out some more complex designs.. challenge yourself to try blocks that you find intimidating, and conquer them! I enjoy hearing about the decisions people make as they select fabric and designs. I think Mom's Quilt is my favorite. You are certainly prolific! I had a year of small quilts - so I have no problem that you had a year of fun with small. For 2013 - rather than setting a quantity, how about learning a new technique or two for the year - or a color challenge. Maybe make it an object to enter into your first quilt show. Spread your wings and grow. Your modern dresden was my favorite. Richard....I don't know how the 2 of you could outdo this year's goal!! you two are wonderful..thanks for the giveaway...I love black and white. I like Tanyas Pinwheel quilt. I love the lego plane! We have lego fun at our house as well. Maybe a goal to make some more bigger quilts, since you mostly do baby and lap quilts? I have to laugh because I am always exhausted reading about your finishes LOL... I would like to see some more bigger quilts and also some more variety. You complete many of the same style but maybe if you change it up it will slow you down and I can catch up LOL! I think my favorite of all your finishes is Zig Zag Now I'm Mad. Wow, when do you find the time to finish all those?!!! Hmmm, maybe you should shoot for 200 in 2013? 12 quilts that represent the holidays and weather of each month (one quilt per month). Though after reading that you did more than a quilt a week, this would be a cake walk. I really like "Mom's Quilt". I think you should try to make 50 quilts in 2013, but at least 3 of them should be LARGE. (and by setting it lower - to just 50- you have two extra weeks to work on the larger ones! Quilting goals for 2013: You could make a quilt for each bed in your house; you could quilt something (table runner, placemats, wall hanging) for each holiday; you could try a new-to-you pattern every month. I would throw out the challenge to try something out of your comfort zone and set that as your goal. You've done the quantity thing; now branch out! I follow your blog on GFC and I get your emails - thanks! I'm simply in awe of your finishes! How can you top that? Perhaps you could set a goal to make a certain number of quilts for a favorite charity? Or maybe choose 12 different techniques or tools that you want to learn how to do and set a goal to master one each month? Whatever you do, I know you will have fun doing it! I am a follower by GFC! I plan to share your giveaway with my guild members! Goal for 2013: Make 10 quilts twin size or larger. You've done a lot in a year! How about focusing on one thing that you feel has been a challenge for you? You mentioned large quilts, but maybe there is a technique you'd like to work on, like dyeing your own fabric or adding embellishments. Follow you via email and google. I follow you by email/Google+. 40? You really know how to stress yourself, Richard! If I were doing it, I might have the goal of 40 for NEXT Christmas! I think you should have a goal of 1 full-size quilt per month. That means double or queen, not twin nor smaller! And 11 must be pieced and one appliqued. =) And heck, let's toss in quilting one by hand! My favorite quilt on your site right now is the Bright Orange and Yellow Patchwork Lap Quilt 40 X 49 inches because it is bright. How about making a twin size quilt as a goal? From there you can go bigger! Zig Zag Now I'm Mad and Granny's Gone Wild are my favorites. I really like the zig zag quilt, although it was a tough decision - you have a ton of quilts to choose from -awesome! This is only my 2nd visit to your blog, so I don't know what you did with all the quilt finishes you had so far. My idea may or may not be a good one because of that. But I'm thinking it might be a good goal to make a certain number of your choosing per month for a charity . . . either the same one or a different one each month. In addition to being helpful for the charity by making some quilts for them, I'm sure the added exposure on your blog will help draw attention to the various charities and will inspire others to give. Just a thought. Richard, you need to step out of the box and make a big quilt for your bed! wow!! 52 quilts this year is amazing!! Is that with you hand quilting or machine quilting them? How about setting a goal for a certain number of NEW patterns to try this year? Your goal should push you out of your comfort zone. Maybe work up in size this year, a baby quilt then a lap quilt, then twin... See how far you can go. I think one way to grow as a quilter is not necessarily quantity but variety. Learn new techniques. One way that I really like doing that is Bonnie Hunter's mystery quilts. (she is in the middle of one right now.) These have stretched me as a quilter. I like your soldier's star quilt a lot! Jared, your flying machine is awesome! My grandson loves Legos too. I LOVE the John Deere quilt you completed. My son collects John Deere memorabilia. He also has a John Deere yard tractor. The granny squares quilt is my favorite. Perhaps you could pick one unusual theme for each month - maybe quilts suggestive of other countries or cultures. Goal for 2013? Make a large quilt. Double or queen would be a nice size. Thanks for the opportunity to win your generous giveaway. I'm a google friend connect follower. . Thanks for the opportunity to win your giveaway. I e-mailed eight of my best quilting buddies and gave them the link to your giveaway! I like your Fire in the Sky quilt. The colours are great! I would say find a pattern you really love and make a full size quilt, no time constraints, just finish it within the year. Darn, looks like someone else posting knocked off my comment about my favorite of your quilts. I listed about 6, but I think I'm going with either one of the dragonfly ones. Maybe you could make some quilts for military families. My favorite is Fire in the Sky. Love the colors. Goal - Well one big quilt of course. You said you hadn't tried it yet so I think you should. Also try something that pushes your current skill level. I screamed at the cats stalking my bird feeder that you are having a giveaway, now get out of my yard and go enter it! My favorites are between bee 2 and plus plus. quilting goal for 2013, is to finish the 2 ufo's I have. Thank you for the chance. I too am having a giveaway. 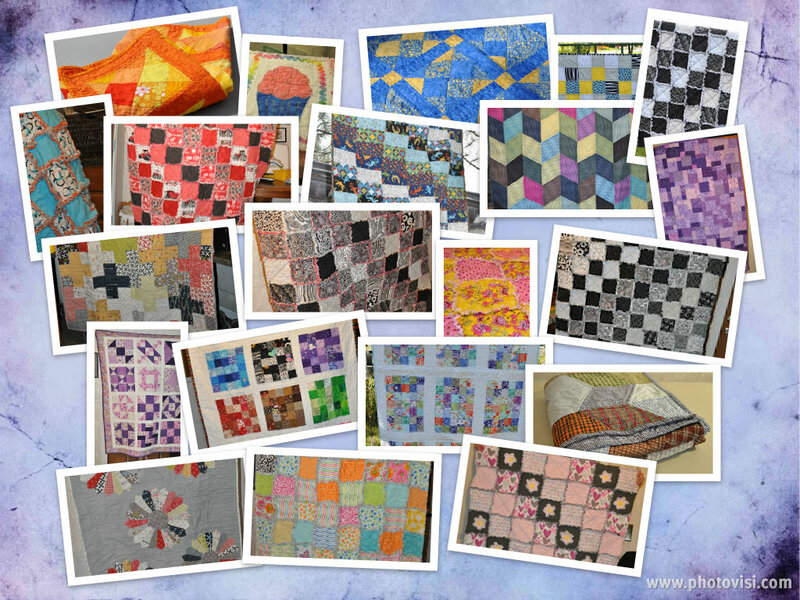 Congratulations on exceeding your 2012 goal of 52 quilts! For 2013, I echo the others' suggestions to try a new technique and focus on learning something(s) new over a specific quantity of quilts. Maybe one new block a week, or one new technique a month. How about if you find a technique that is more challenging and try it. You could set a goal of one quilt per month with this new technique. Make it a larger quilt to challenge yourself to do it. Those are the best ways to push yourself to grow as a quilter. I follow you through GFC and email. You guys are so prolific in your quilting. Maybe you could do a color challenge each month - reds in January and so on. I love the B&W fabrics. I am a follower. Try out a technique you haven't tried yet. It will help you expand your quilting horizons. I love trying new techniques and tools. Thanks for the chance at winning. I just finished a black and white quilt so my stash is depleted! I follow via GFC, Google Reader and email! A couple of possible goals would be: a hand-tied quilt (that's one of mine for 2013), and curves (I MIGHT try one next year). I really like the Flower Patchwork (the one that uses Moda's Twirl)! Well, one goal I had for 2012 was to learn to Paper piece. I don't know if you know how to do that, but maybe you'd want to try that in 2013. =) Thanks for a chance to win that lovely bundle. Actually, you've made a lot of nice ones. I"m going to tell my flickr group about your giveaway! =) Thank you again. How about increasing the difficulty level of the quilt? Try some new techniques? or crazy quilting? Maybe your goal should be to make some larger quilts. Don't worry about quantity. When I started quilting, I make some small quilts and hand quilted, then I moved up to twin size, then full size, queen size, and king size. I machine quilt them now, but I did hand quilt a queen size quilt. Just a suggestion to either make bigger quilts or to hand quilt some quilts. Seguidora GFC e E-mail.Obrigada por abrir internacional,sou Brasil.Obrigada. I love the way you make your goals for this year and what a great accomplishment.. I would never dare to do such big goals as I know my limitation.. I would like to suggest maybe you could aim to learn new things and a project on it each month of next year. Like first month: epp and a finished product. 2nd month : free motion quilting and a finished product etc.. I am looking forward to follow your attempts and goal! Diga a Jared que sua máquina é a mais linda do mundo.Estes tecidos foram escolhidos com o coração,são linnndos. I love Soldier Star. I am looking forward to make one big quilt with just a star on it.. Lone star is my target. Suas colchas eu adoro e até já copiei algumas para meus netos(que vergonha).Mas a que eu fico encantada e nunca fiz foi Cartões Vovô é apaixonante. My goal is to complete small wall quilts for each month. I <3 your Granny's Gone Wild quilt. The colors are so pretty. Hello from Minnesota! I'm a follower by email updates. I love to drop in and check out what you have been up to. You have a made a staggering number of quilts this year. Maybe next set a number of so many to be given to charity? There are a lot of them out there and I'm sure some even close to home. I think for 2013 you should commit to some bed-sized quilts and alternate with some mini ones (mug rugs or doll quilts for charities.) What do you think? Acho que posso comprar um mega-fone amanhã para anunciar o seu prêmio,mas se a vizinhança me xingar.... vou passar seu endereço de E-mail para prováveis reclamações. You could make a goal of a certain # of quilts to enter into a show. My favorite finish is the Plus Plus quilt. A goal? My goals always have to do with making money for a family vacation from selling things. Maybe you could make a goal of doing something that would benefit a charity? Like a quilt for an orphan? Personally, I would keep your goal the same. You don't want to take the joy out of the quilting by being stressed over trying to finish them. Maybe a king/queen size Quilt for your bed. One is not so intimidating! Maybe join a flicker swap where you swap a small item. One for Charity. Then 52 to sell because you both quilt for a living! I follow all kinds of ways. But google + always lets me know what is happening! Stop by and sign up for my giveaway! You already know what your goal is....a larger quilt.....come on you can do it!!! I suppose a goal to set would be to make a quilt in each size since you said you sort of stick to baby quilts and lap quilts...so maybe a baby quilt, lap quilt, twin, full size, queen and if you get to feeling very adventurous King. I'm super impress with the 52 baby/lap quilts...I do get to get 5 or 6 done and that includes wall hangings. lol. Great giveaway. your completed quilts....I am loving plus plus (keep wanting to do this one myself) or Mom's Quilt....wonderful!! What a neat bundle of fabrics. I have been wanting to make a black and white quilt for my sister. I am a follower via GFC and BlogLovin. I think your goal should be to make a bed quilt for yourself and your kids!! These could be simple or complex. But, challenge yourself to make bigger quilts. Useable, everyday bed quilts are a great place to start with bigger quilts. Even if they are not perfect, you will have a good start on learning more skills to make bigger quilts. WoW! It is so wonderful that you and your wife have made so many quilts! How great that you are able to share your hobby together. Since you have made so many baby size quilts I'll suggest you try making a larger quilt. After all, a larger quilt is just three or four baby quilts put together, hehe. I have one quilt that will be king size when I'm done. I'm hoping next year to finish it. The pictures of your finished quilts are amazing! You guys do beautiful work. I really love your Halloween quilt. One of these days I want to do a big applique Halloween quilt. I have the pattern and kits so I'm halfway there, hehe. Love the Lego airplane your son made! I worked for the airlines so planes are special for me. and shared on my FB. I used your share buttons below. Thanks again for a chance to win some awesome fabrics. Well, you said it, I'd like to see you make a large quilt. Make one for your own bedroom, it gives motivation to make it fit your bed! Small quilts are a great way to practice - make a goal to make a big quilt now! Wow what an amazing accomplishment! I'm not sure what to suggest for a new goal... maybe bigger quilts or something more complex? Goal for 2013: Make at least 4 bed-sized quilts! I know you guys can make it. I have just basted my sons twin-sized quilt, it is the biggest I have made so far, and it is 70" x 90". I have only been qulting for approx. one year, too! Plus quilts are fun, I have made one table runner with that design. My fave quilt from your complete page is Twirl Magic - difficult choice though! I think you should each pick a difficult technique that you would like to master this year. Paper piecing, cathedral windows, Y seams, a kaleidoscope quilt - some ideas. You've made lots of great quilts this year but I think my favourite is Zigzag Now I'm Mad. Love the "Monsters on the Loose" quilt. I am a follower. Great giveaway, thanks. I`m a follower by email.Awesome giveaway.Thanks for the chance! Quilting goals for 2013 make more Dear Jane Blocks and quilting some of my top. There are many favorite but I pick Granny squared! Wow, what a lot of quilts! I think you should challenge yourself to make a quilt each month with a new technique - curved piecing, needle-turn appliqué, hand quilting etc. I am spreading the word to my friends. As a goal for next year, maybe you should try one huge quilt. I told my friend to enter your giveaway too. First of all I'm amazed at the number of quilts you finished this year. Congratulations! One goal you might set for yourself (selves) is to learn a new technique each month & try it out on a quilt: set-in seams, foundation paper piecing, applique, etc. I'm being more cautious in my 2013 goals: quilt some more of my stack of tops & try out applique. Thanks for the giveaway. I've been following by email. Thanks. I love your Plus Plus quilt. Thanks for the chance to win. A suggestion for quilting is maybe make some more tutorials for 2013. I love your "Granny Squared" Quilt. Love all the blacks and whites FQs. A very nice collection. thanks for a chance to win. I like the quilt you made for the Dresden challenge....sort of a snake-looking quilt. beautiful! Thanks for another chance to win. I like your colour choices for Deer Valley. Thanks for the giveaway. 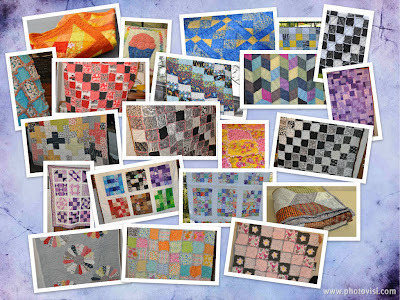 A great goal for 2013 would be to learn a new technique every month and display it in a quilt. I follow your blog by email notices.